Say goodbye to winter’s chilly winds and welcome in spring’s warm weather! There is no better way to say hello to spring than with a cute pair of wedges. Grab yourself a pair of Me Too Alanna memory foam wedges so that you can show off that cute pedicure you have been hiding in your boots. Not only will you look great but feel comfortable too! Alanna wedges are beautifully designed with a memory foam cushioned lining and a velcro back strap for ultimate comfort and style. Find out why Alanna is a perfect comfort memory foam wedge. Are your current wedges causing foot pain, heel pain, back pain or other foot problems? Stop hurting your feet and get yourself a pair of comfortable wedges with supportive cushioning. Well, guess what? Alanna is a super comfortable wedge with a ¼ inch memory cushioned lining that provides an excellent cushion while reducing heel shock and pressure; to help reduce your pain. This comfortable wedge can help you eliminate relief from the discomfort of heel pain by cushioning your foot in every step. Wedges come in different forms and types; however, do you know what sets Alanna apart from most? Let me tell you what makes Alanna different. 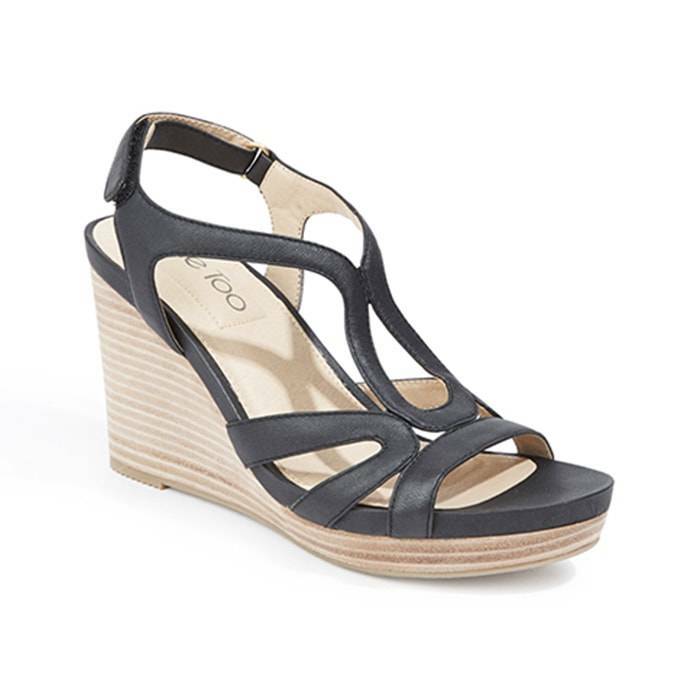 Not only is this wedge sandal a hot trend this season but also a comfortable sandal with adjustability. This wedge sandal features a velcro back strap that adjusts to your foot and ankle while giving you a feel of comfort with every step. Moreover, Alanna gives you peace of mind from not worrying about loose wedges rubbing on your ankle. So you can adjust the shoe to your comfort level and not worry about sloppy straps hurting your ankles. Why limit your wedges to only one or two colors? With Alanna, you can choose up to four colors to match with your changing wardrobe. Choose between the black and white to match with most outfits or wheat and mink for a more sophisticated look. Put away your fall boots and make room for spring wedges! The sooner you trade your boots for wedges, the sooner your feet will breathe again. Let us help you find comfortable wedges through a personalized shoe fitting and a free foot analysis. Click here to schedule your free foot analysis. Come into any one of our stores located in Anaheim Hills, Rancho Cucamonga, Riverside, San Dimas, Temecula, La Quinta and Palm Desert! Visit us today so you can try on a pair of Adam Tucker Memory Foam Wedges! At Lucky Feet Shoes, we carry many Adam Tucker shoes: sandals, heels, wedges, flats, booties, and boots; in order to provide you with a large selection of comfort shoes. Come and visit us today! If you are looking for Memory Foam Wedges in Anaheim, Anaheim Hills, Yorba Linda, Brea, Orange, Placentia, Costa Mesa, Santa Ana, Fullerton, Irvine, Villa Park or Tustin; visit our store in Anaheim Hills for your footwear needs. If you are looking for Memory Foam Wedges in San Dimas, Glendora, Pomona, Covina, West Covina, La Verne, Azusa, Diamond Bar or Claremont; visit our store in San Dimas for your footwear needs. If you are looking for Memory Foam Wedges in Rancho Cucamonga, Ontario, Upland, Fontana, Rialto, Chino, Chino Hills, Mira Loma, Eastvale, Colton or San Bernardino; visit our store in Rancho Cucamonga for your footwear needs. If you are looking for Memory Foam Wedges in Riverside, Moreno Valley, Corona, Rubidoux, Loma Linda, Grand Terrace, Redlands or Norco; visit our store in Riverside for your footwear needs. If you are looking for Memory Foam Wedges in the Temecula Valley, Murrieta, Fallbrook, Lake Elsinore, Wildomar, Hemet, San Jacinto, Pala, Sun City, Menifee, Canyon Lake, Perris, Bonsall or Anza; visit our store in Temecula for your footwear needs. If you are looking for Memory Foam Wedges in Indio, Coachella, Thermal, Vista Santa Rosa, Valerie; visit our store in La Quinta for your footwear needs. If you are looking for Memory Foam Wedges in Cathedral City, Thousand Palms, Palm Desert, Palm Springs, Desert Springs, Rancho Mirage or Bermuda Dunes; visit our store in Palm Desert for your footwear needs.